The Business Contact Manager for Outlook workspaces can display gadgets and lists of records on tabs. Adventure Works customized the Sales workspace by adding a gadget and a tab to allow them to view and access information about potential, current, and past sales. See the following image to see what has been added. Figure 1: An additional Sales Funnel gadget. Figure 2: A tab labeled Stores. Figure 3: Sections have been added to the Reading/Preview Pane. Add another gadget, create a new tab, and change the sections that are displayed in the Reading/Preview Pane. The Adventure Works Sales workspace displays information about overall sales for the company. Make a few changes to the Sales workspace to see more of the information about sales. First, add a gadget to the Sales workspace to keep track of the best-selling products. On the Ribbon, click the Gadgets tab. In the Add Gadgets group, click Sales, and then click Top Products. Tip: If the gadgets area is hidden, click Show Gadgets to display it. Adding a gadget also displays the gadgets area. The Adventure Works tabs have already been customized to include a Stores tab. This tab displays contacts for potential bike outlets for the company. 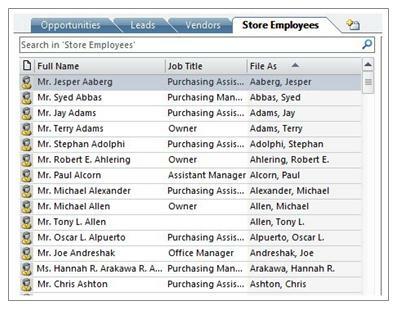 In order to prepare for your sales visits, you can add a new tab, displaying the employees at those stores. 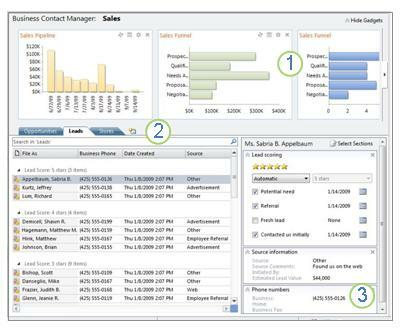 In the Sales workspace, click the Create New Tab button ( ). 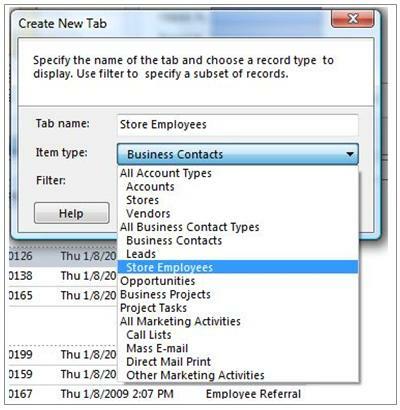 From the Item type list, under Business Contacts, click Store Employees, and then click OK. The new tab displays all the Business Contacts designated as Store Employees in the Adventure Works database. Tabs display lists of records, and a preview, or details, of a selected record in the Reading/Preview Pane. Sales people at Adventure Works want to see the birthdays of store employees when viewing records. Add a section to display the birth date listed in each record. On the Store Employees tab, in the Reading Pane, click Select Sections. In the Select Sections for Store Employees dialog box, under General, select the Personal information check box, and then click OK.
On the tab, click Jesper Asberg and then scroll through the Reading Pane to the Personal Information section and see the date of his birthday. In the Reading Pane, click the Personal Information section, and then drag it to the top of the pane.